Col (Dr.) Derrick Hamaoka serves as the Assistant Chair, Medical Education, for the Uniformed Services University of the Health Sciences Department of Psychiatry. 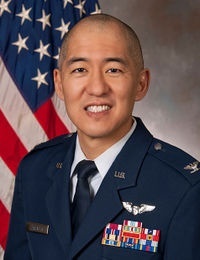 Col Hamaoka is a graduate of the Uniformed Services University of the Health Sciences School of Medicine (1999) and the University of Texas Health Science Center Psychiatry Residency Program (2003). Prior to serving in his current position, he was the Associate Program Director, University of Texas Health San Antonio Psychiatry Residency Program, leading one of the largest programs in the nation and responsible for the majority of the active duty Air Force psychiatry pipeline. He holds the Air Force Medical Corps Academic Grand Master (ME) Special Experience Identifier (SEI). He also serves as the Defense Institute for Medical Operations director and subject matter expert for the Mental Health Services After Disasters & Combat course, providing support/education for recent missions to Iraq, Sierra Leone, Tunisia, Colombia, Mexico, and Slovakia.